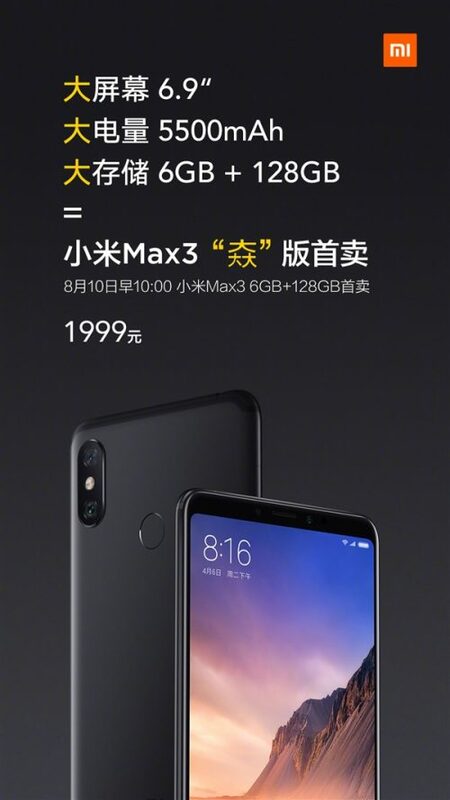 Xiaomi Mi Max 3 with 6GB RAM will go on sale starting August 10 - Playfuldroid! Announced back in July last month, the Xiaomi Mi Max 3 is currently available only in the 4GB+64GB model which comes with a reasonable price tag of 1,699 Yuan (US$ 249). Today, the Chinese company had confirmed that the higher-end model with 6GB+128GB memory configuration will also go on sale starting August 10th this week. The 6GB+128GB model will arrive at a slightly higher price tag of 1,999 Yuan (US$293) which was attributed by the bigger RAM and a doubled storage space. Aside from a huge upgrade to its memory compartment, the rest of its specs remain similar to the current model with 4GB RAM. The Xiaomi Mi Max 3 features a 6.9-inches IPS LCD display with 1080 x 2160 pixels screen resolution and an 18:9 tall aspect ratio. The device is powered by a Snapdragon 636 SoC and has a vertically-aligned dual camera setup with a pair of 12MP+5MP sensors respectively. On the front, there is also an 8 megapixels front-facing camera for selfie and video-calling purposes. In terms of software, the smartphone will run on the company’s in-house MIUI 9.5 atop the Android 8.1 Oreo out of the box. A 5,500mAh non-removable battery is available under the hood to keep its lights on for a decent amount of time.